In 2007, DC Direct released this Superman figure based on the animated movie Superman: Doomsday. The figure, with a mere four-points of articulation, comes with a rubber cape and an ’S’ symbol shaped figure stand. The carded figure also comes with a mini movie poster. 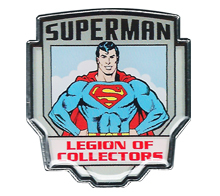 Other figures in the line were Doomsday, Solar Suit Superman, Lex Luthor, and Superman’s Robot. February 1, 2018 in FIGURES / STATUES. December 26, 2017 in FIGURES / STATUES. September 21, 2017 in FIGURES / STATUES. Produced in 2003, this is a DC Direct Justice League Superman Mini-Maquette based on the animated series Justice League. This is a smaller version of the full sized maquette and stands at five and a half inches tall and is made of cold-cast porcelain. July 20, 2017 in FIGURES / STATUES. This is the DC Direct 7-inch action figure based on the graphic novel All-Star Superman. Based on the art of Frank Quietly, the figure has nine points of articulation and comes with a DC Comics logo base. May 15, 2017 in FIGURES / STATUES. February 1, 2017 in FIGURES / STATUES, FILM / RADIO / TELEVISION. January 31, 2017 in FIGURES / STATUES.